Mix the Burger Bowl list of ingredients until combined and separate into 8 approximately 2in balls. Form each ball into a bowl shape with your thumbs or by pushing down in the center with a ramekin. Bake for 15-18 minutes, or until the burgers are almost done. Fill the burger bowls with 1/4 cup shredded cheddar cheese and about a tablespoon of sauteed onion each. Bake for another 5-7 minutes until the cheese is melted and a meat thermometer reads 160degF. 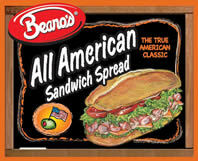 Top with Beano’s All American Sandwich Spread, lettuce, and pickles. Makes 8 burger bowls. Serve with fries and enjoy!